It’s odd, this is the first month when I have not been soooooo stressed out about private practice. It’s the first month when I began to enjoy the process rather than frantically worrying about how to get clients and become full. YET… oddly… this is the first month I have seen zero clients! WTF!??! You see… I made a mind shift after writing last month’s blog (when I was questioning if private practice was right for me, since I didn’t have a lot of clients). Before this month, my main goal was to have 20-25 clients by September. What I didn’t realize was that the problem with this type of goal is that it is contingent on something you cannot control. You cannot control the number of clients you get. Yes, there are soooo many things you can do to try and increase the likelihood of people choosing you as their therapist, BUT you cannot control if people will actually come. I realized that having a goal focused on something I could not control, and measuring my success on it, was not healthy for me. So, I made a mind shift. And, this month I switched my main goal to something that I could achieve… creating and sustaining a social media marketing plan by September. Hopefully, the residual effect will be getting more clients (I’d like to stay in business!). 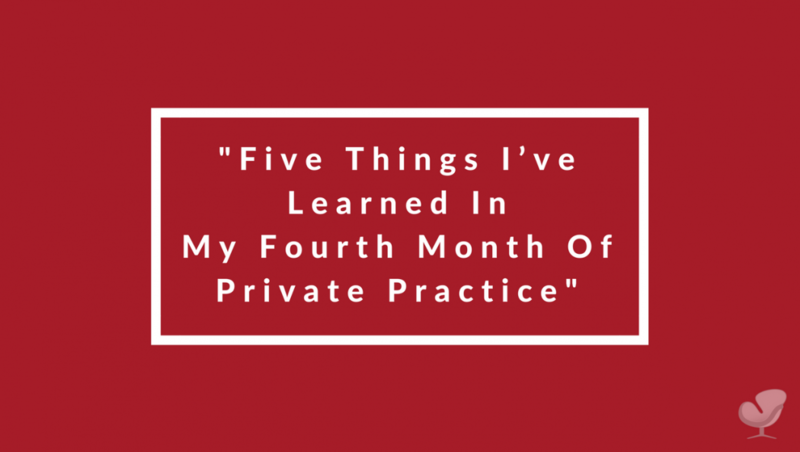 But, for me, private practice success will now be measured on how I’m building my private practice, NOT the number of clients that I am seeing. Maybe I’m jinxing myself, but I have this feeling that clients will come… I don’t know when… but they will. And I need to stop worrying about it and focus on developing an awesome practice! OKAY, back to five things I’ve learned this month! Most importantly, I made a video!!!! So, for this month, I dedicate my five things to how to create an introduction video!!! Enjoy! Since I decided to do private practice, I knew that I wanted to create an introduction video. I knew that making a video was the most important step in building trust with potential clients. 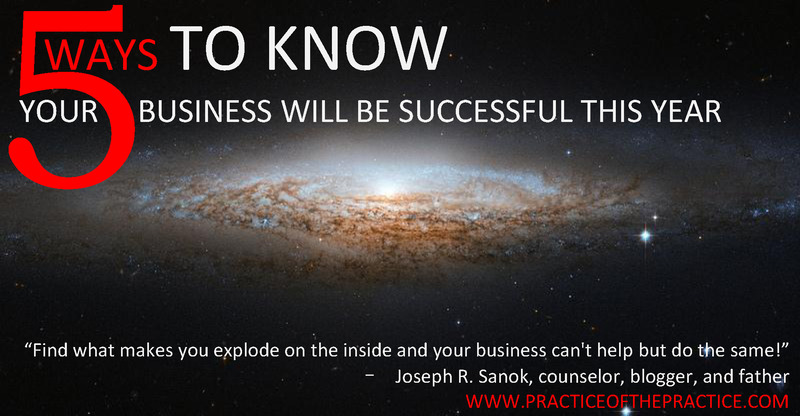 Side story – when setting up my private practice I decided to consult with Joe without ever listening to his podcast! Why did I choose him? One of the main factors was that I felt I could trust him after watching his “How to start a private practice in one day for under $200” (see below). He was genuine, knowledgeable, and likable and the video was professionally done. He was not just a picture with some words. He became a real person with video. Moral of the story: GET A VIDEO MADE. You are selling an expensive service, so make sure your video is good quality! Hire a videographer that has experience and can edit your interview with images of your office and you counselling an actress/actor. By showing a video of you actually counselling someone (that is smiling) will imply to viewers that you are good at your job and can help people overcome the problems they are facing. Make sure that what you choose to say in the video connects with your audience or ideal client. If you’re not that great at writing, hire a consultant to help you figure out what to say. When writing my script, I really struggled with what to say! Like sleepless nights trying to figure it out. So, I chose to consult with Cupla Media who asked me a series of questions that helped me transform my boring script. When Cupla Media suggested I ask parents about my script and ask them “When did you feel connected? When did I loose you?” my eyes opened and I realize that my script was tooooooo professional and academic. What I really needed to be doing was writing a script that potential clients could connect with, NOT a script showing off my knowledge and stating what degrees I have! Be yourself. But, for the video, be the best version of yourself! Make sure your clothes fit, your hair is styled, and (for females) put on a bit of makeup. Video can make your skin look dull, which definitely won’t appeal to potential clients. If you feel uncomfortable about putting make-up on (like me), but don’t want to spend the money on a make-up artist (like me), MAC has great programs where they teach you how to do your makeup, one-on-one. It does cost a bit of money, but then you can do your makeup for all your future videos and photo-shoots (saving you money in the long run)! Have you ever been scrolling on Facebook and a video appears on your feed, you begin to scroll past it but the subtitles catch your eye and you end up watching the video? This is why you need to get closed captioning for your video! You want to get as many views as possible once your video is finished. If your videographer does not include this, you can do it yourself for under $10 at 3playmedia.com. Closed captioning is also great because it gives you a transcription of the video that you can use in a blog or other social media sites to increase your SEO. P.S. : Click here to check out my introduction video! Julia Smith, BA, MEd, CCC, is the owner of Insight Mental Health Counselling in downtown Halifax, Nova Scotia. She specializes in helping teenagers stop depression from affecting their lives. 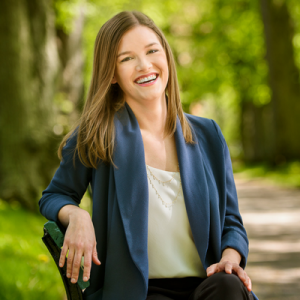 Click here to learn more about her downtown Halifax counselling practice!